The Religious Leaders of Cyprus met at the Swedish Residence in Nicosia on July 19, 2016 for the last time convened by Swedish Ambassador Klas Gierow, whose term in Cyprus ends this month. Both Archbishop Chrysostomos II and Mufti Talip Atalay in bidding farewell to the ambassador expressed their sincere appreciation for his contribution in establishing, facilitating and nurturing the relationship of the religious leaders and peacebuilding in Cyprus. “Your mission in Cyprus has been more successful than you think. 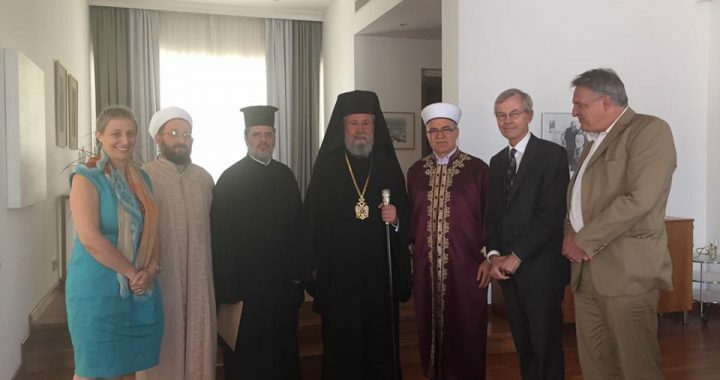 If it was not for the Swedish initiative and the support of your Embassy, the Mufti and I would not have met with one another nor developed the trust and relationship we have with one another today.” Said Archbishop Chrysostomos II of the Greek Orthodox Church of Cyprus. “We are grateful for the Swedish government’s and your Embassy’s support to the tireless efforts of the Office of the Religious Track as well as your friendship and personal involvement in it.” Said Dr Talip Atalay, Mufti of Cyprus. “Our togetherness in itself is historic and we owe that to the Swedish initiative”. “As religious leaders you have shown that dialogue and communication is an important element of a healthy society, where human rights and religious freedom are respected. Together you are making a unique and very constructive contribution to peace in Cyprus.” Said Klas Gierow, the outgoing Ambassador of Sweden. Both religious leaders reiterated that they will continue their efforts for mutual understanding, support confidence building measures and peaceful coexistence in Cyprus. Ambassador Gierow thanked them for the trust they have shown to him, the Swedish government and the facilitation of RTCYPP. Religious freedom as a fundamental human right remains at the core of the religious leaders dialogue for peace- the so called religious track. Leaders agreed to have their next high-level meeting with all religious leaders sometime in early October. The New ambassador of Sweden is scheduled to arrive in September. Background Note: With the facilitation of the Office of RTCYPP under the auspices of the Swedish Embassy, these two religious leaders met for the first time ever in March 2011 achieving unprecedented steps together for the advancement of religious freedom in Cyprus. In 2012 they agreed to invite religious leaders of the Armenian, Maronite and Latin churches to join them and in 2013 they gave their support to Office of RTCYPP which in close cooperation with the United Nations Office of the High Commissioner for Human Rights and the special rapporteur for religious freedom or belief to initiate the creation of the first ever inter-religious platform for human rights bringing together representatives of all the faith communities of Cyprus as well as members from the non-governmental human rights and peace organizations in Cyprus. On July 7 2016, Mufti of Cyprus, Dr Talip Atalay led prayers at Hala Sultan Tekke for 1000 pilgrims of Turkish origin who reside in the northern part of Cyprus. This special pilgrimage was organized within the framework of the Religious Track of the Cyprus Peace Process, under the Auspices of the Embassy of Sweden, and facilitated by UNFICYP on the occasion of Eid Al Fitr or Ramazan Bayram. The Mufti received greetings for the Bayram from ambassadors and country representatives, the head of the Church of Cyprus H.B Archbishop Chrysostomos II through his representative, Archimandrite Rev Ioannis Ioannou of Apostolos Barnabas Monastery and representatives of the Armenian, Maronite and Latin religious leaders of Cyprus. “The essence of Islam highlighted during the holy month of Ramadan with fasting and prayer is to train our egos to reach inner peace. While we celebrate the feast of Al-Fitr we are also grieving for the recent loss of innocent lives to terror attacks abusing the name of Islam. Taking the life of an innocent human being is the same as taking the life of all creation. As a Muslim, I call on everyone in the world with goodness in his heart, to come and stand together against evil in the world. We may have differences but we have to be able to live together. We believe humankind will find peace and learn again to live together and coexist when they learn to train their egos, which is a fundamental teaching of Islam. It is our obligation and duty to be a positive example in our island and the region as a whole. As religious leaders we should give a message of peace and coexistence, not that of politics, living together as one family like brothers, sisters and as neighbours in peace,” said Mufti Dr. Talip Atalay. “We are witnessing something Cyprus has never experienced in over five decades thanks to the efforts of the religious leaders and the Office of RTCYPP under the Auspices of the Embassy of Sweden”, said Ambassador of Sweden Klas Gierow. “Religious leaders advocating for the others right to worship, to have free access to their places of worship and celebrate each others feast together. Todays’ sprit is what needs to be nurtured and spread out in Cyprus. Open churches, open mosques with free access for prayer for those who believe and want to pray”. This is the 6th special pilgrimage to Hala Sultan Tekke in Larnaca since 2014. 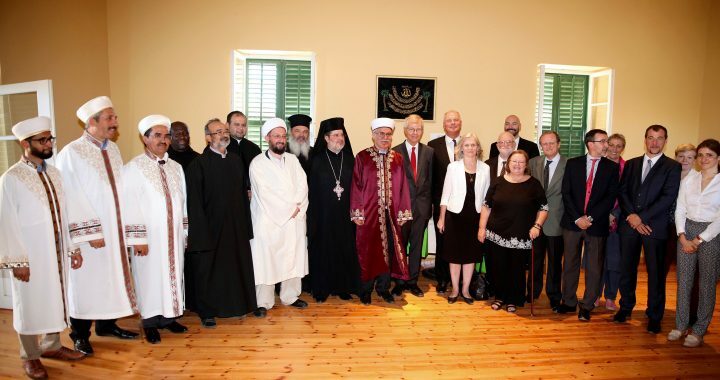 As a result of an unprecedented agreement between the religious leaders of Cyprus, namely H.B. Archbishop Chrysostomos II of the Church of Cyprus and the Mufti of Cyprus H.E Dr. Talip Atalay with special permission from the Foreign Minister of the Republic of Cyprus. The agreement, also supported by the political leaders of Cyprus, was reached in 2014 within the framework of the Religious Track of the Cyprus Peace Process under the Auspices of the Embassy of Sweden (RTCYPP). On the occasion of Eid Al Fitr – Ramazan Bayram, the Mufti of Cyprus will be leading a special prayer service on 7 July 2016, for 1000 pilgrims of Turkish origin who reside in the northern part of Cyprus and cannot otherwise visit and pray at Hala Sultan Tekke in Larnaca. The special pilgrimage to Hala Sultan Tekke for Turkish origin persons is a result of an unprecedented agreement between the religious leaders of Cyprus, namely H.B. Archbishop Chrysostomos II of the Greek Orthodox Church of Cyprus and the Mufti of Cyprus H.E Dr Talip Atalay. The agreement, also supported by the political leaders of Cyprus, was reached in 2014 within the framework of the Religious Track of the Cyprus Peace Process under the Auspices of the Embassy of Sweden (RTCYPP). H.B Archbishop Chrysostom’s II will be represented by Archimandrite Rev Ioannis Ioannou, abbot of Apostolos Barnabas Monastery, who will bring the greetings of the Archbishop to the Mufti and the Muslim faithful on the occasion of Ramazan Bayram- Eid Al Fitr. The Maronite, Armenian and Latin religious leaders will also be sending their representatives. H.E Mr. Klas Gierow, Ambassador of Sweden will be joining the religious leaders together with other ambassadors and representatives of the diplomatic community in Cyprus. Hala Sultan Tekke will be closed on July 7th until 16:30 for tourists and other faithful to accommodate the special pilgrimage that is facilitated by UNFICYP in coordination with the Office of RTCYPP. There will be press conference at 14:15 in the main hall at Hala Sultan Tekke. All interested media should send their full names, ID numbers and vehicle registration numbers to the Office of RTCYPP to linnea@religioustrack.com the latest by 5th July at noon. Only registered media with valid IDs will be permitted to cover the event. Since 2014 as a result of the Religious Track and with permission from H.E. Mr. Ioannis Kasoulides RoC Minister of Foreign Affairs special pilgrimages have been taking place regularly for the first time in Cyprus on the occasions of Eid Al Fitr, Eid Ul Adha and Mawlid, organized and led by Mufti Talip Atalay, facilitated by the Office of RTCYPP and UNFICYP. Hala Sultan Tekke is acknowledged and respected as a place of worship. It is open daily from 8:30 – 19:30 only in the summers and 8:30 – 17:00 only in the winters for prayer and worship where Turkish Cypriots and other Muslim faithful are free to practice their faith. Imam Shakir Alemdar, appointed by the Mufti of Cyprus, is responsible for the worship life of the Tekke as well as all other needs of the Muslim faithful. The Religious Track of the Cyprus Peace Process under the Auspices of the Embassy of Sweden (RTCYPP) is an unprecedented peacebuilding effort of the religious leaders of Cyprus committed to work jointly for human rights, peace and reconciliation, initiated and supported by the Ministry of Foreign Affairs of Sweden. The Office of RTCYPP is established to encourage, facilitate and serve the religious leaders’ dialogue and efforts for religious freedom and peace in Cyprus and to contribute positively and constructively to the Cyprus peace talks. The Office is based at the Home for Cooperation in the UN controlled buffer zone in Nicosia. Since 2011, the religious leaders of Cyprus have agreed to focus on four pillars: To get to know and build trust among the religious leaders and respective faith communities; To promote confidence-building measures; To advocate for the right to free access and worship at churches, mosques and monasteries; To ensure the protection of all religious monuments in Cyprus.